HostPresto! > Help > Hosting > DNS, Redirects & External Services > How Do I Point My Domain to Another Provider? 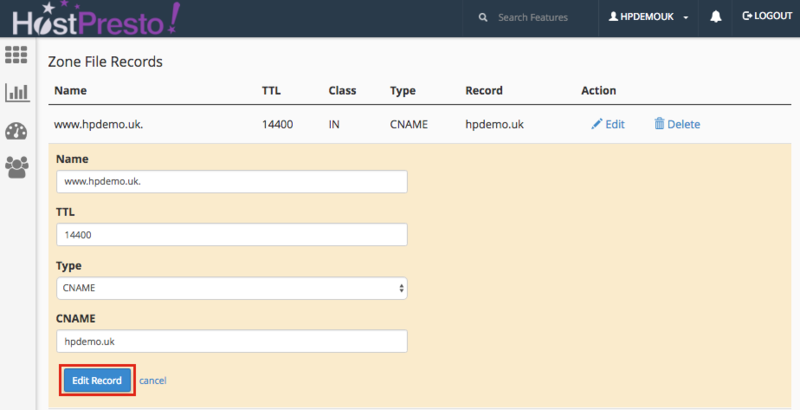 You can point your domain to another provider by editing two records via your cPanel control panel. Please understand however that this process can take up to 24 hours to update. This article assumes that you already have another domain provider in place and that you've been provided with the relevant information to point your domain to them. Scroll down to the the 'Domains' section and choose 'Advanced Zone Editor'. Select the domain that you wish to point to another provider from the drop down menu. Scroll down to the 'Zone File Records' section. The first record that needs to be changed is the root 'A' record (also known as @). Look through the zone file records for the 'Type' which is 'A' and choose 'Edit'. 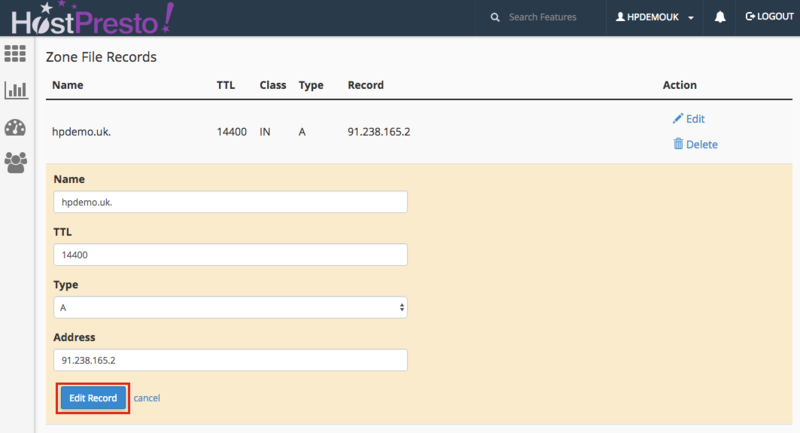 Type in the alternative provider's IP into the 'Address' section and then select 'Edit Record' to complete the change. Note the dot . character at the end of the name is essential. Next, if you have been given a CNAME record, again look through the zone file records for the 'Type' which is 'CNAME' and choose 'Edit'. Make the necessary changes as per the your domain provider's information and then select 'Edit Record'. Again note the dot . character at the end of the name is essential. Pointing your domain to another provider is now complete.